If you are looking at other lift/transfer pumps and they don't have Cummins ABFJV cast into them, then they are not OEM and are just a cheap knock off. This pump is an genuine Cummins part, will flow more volume and is an upgrade for replacing part #'s - FP916, 3936322, 3415661, 3930134, 3932224, 3933252, 3936316 and 4944710 OEM lift-pumps. 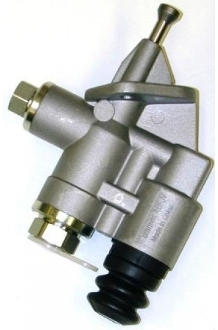 This provides more fuel volume, supporting larger injectors and inj pump mods, while better maintaining feed pressure to your injection pump, thus keeping the static timing of inj pump within proper spec's. Note : A new lift pump will not fix either a simple air drain back problem or weak or faulty overflow valve. Please don't waste my time if you refuse to fix an existing problem or one the is caused by disturbing old hoses.